Hi girls! 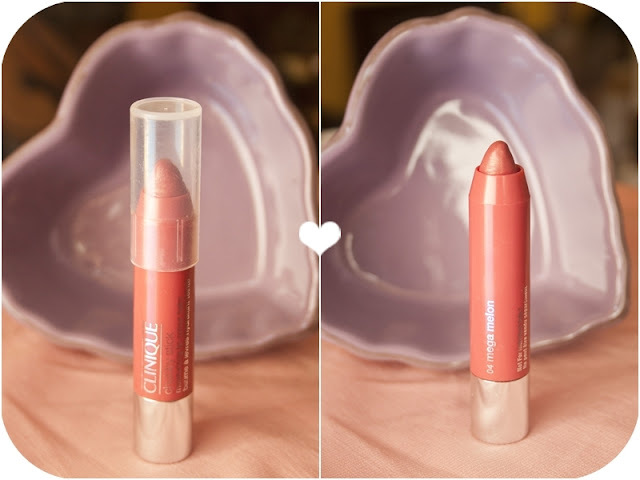 Today I wanted to show you girls a lippie that I've been loving for a while: Clinique Chubby Stick in the shade #04 Mega Melon. You probably know by now how much I adore Clinique as it did helped me to get rid of my acne but.. make-up? I tried only one foundation, Anti-blemish Solutions and even though it did not break me up I didn't like it at all as it was quite cakey. For that reason I stayed away of their cosmetics until I saw a big sale on a travel kit which contained many products for a great price so I went for it! 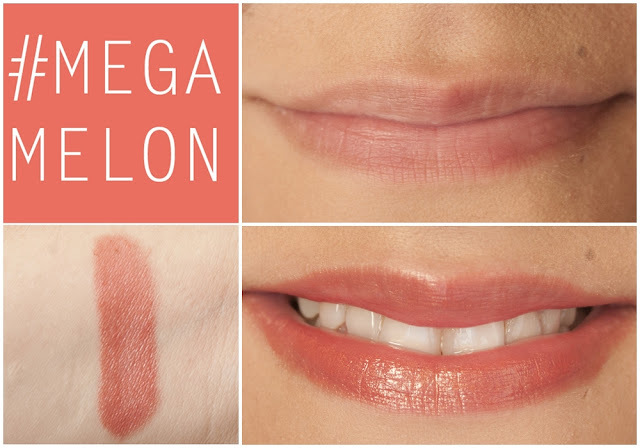 Hola chicas, hoy queria mostrarles un labial que me gusta muchísimo: Clinique Chubby Stick en #04 Mega Melon. Probablemente ya sepan que amo Clinique ya que me ayudó mucho a curar mi acné pero los maquillajes no me atraían mucho. Probé una sola base y aunque no me sacó granitos me dejaba la cara como empastada y desde ahí no probé mas cosmeticos de esta marca hasta que vi una promo muy buena por un travel kit y no la pude dejar pasar! I got this lip colour balm at the same time I got my Revlon Lip Butters which I love but if I had to compare them, there is definitely a big difference between them. This chubby stick made of mango and shea butters is a lip balm with a very decent pigmentation, they are ultra nourishing, soft and a bit glossy. I am not a fan of lip glosses but this product contains the exact amount of gloss to make your lips look healthy. Plus, is not sticky at all. What I like the most of this chubby stick is the color, I know there are other very colorful chubby sticks and I probably have picked the most boring one but hey, you can't go wrong with this color! It's a perfect 'my lips but better'. I believe it's a great option for those days when you don't feel like adding lots of colors to your skin but you don't want to be boring either. The only con I find about this product is the price, I got it for a very low price but as you can see I have a travel size one. The original size retails at $16 USD. Me llego este bálsamo con color al mismo tiempo que los lip butters de Revlon que amo, pero si tuviese que compararlos son muy diferentes ya que los chubby sticks son mucho mas hidratantes. Estos labiales hechos con mango y manteca de karité tienen una pigmentación decente, son muy hidratantes, suaves y algo glossy. Nada pegajosos. Lo que me gusta más de estos labiales es el color, sé que hay muchos colores mas llamativosy y que seguro elegí el más aburrido pero hey! este color va con todo, perfecto para esos días que no querés ponerte algo que llame la atención pero tampoco usar nada. La única contra es que no son baratos, están a $16 USD, aunque como dije, yo lo pagué muchísimo menos por ser una promoción. So what do you think about it? Have you tried these? Ya los conocen o probaron? Les recomiendo que lo hagan porque a mí me encantan! I love this! Not boring at all! I have Chunky Cherry and have to say I'm very impressed with these. I love the color. It's gorgeous on you. Not really liking the price though and I've been pretty happy with the Revlon balm stain. Love this color! It reminds me of Revlon's balm stains too, though those dry my lips out a little. Pretty sheen, too. Divinoooo! por lo que escuche hay muchas opiniones encontradas con respecto a este producto... me gustaria probarloo! 16 $USD? Bueno, cuando uno ve un color tan bonito (y que lo enamora), capaz que se le olvida. Que lindo color!!! Sabes, nunca he probado los chubby sticks. Lo se, lo se... I need to! Parece precioso, además va con todo!